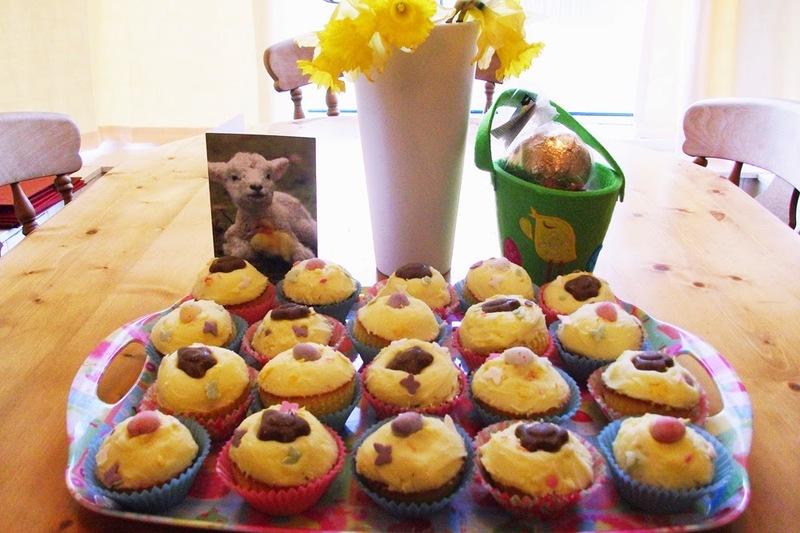 Earlier this week I made some Easter cupcakes for M with chocolate sponge and orange butercream topping. They make the perfect Easter treat. You could give them to your family as an alternative to chocolate eggs or just serve them as a treat after your Easter meal. My recipe (makes 12 cupcakes at roughly 270 kcals each). 1) Beat together the butter and sugar in a bowl until the mixture is light and fluffy. 4) Bake in the oven for approximately 8-12 minutes AT ABOUT 180 degrees until raised and brown. 5) While the cupcakes are baking, start making the topping. Beat the butter in a bowl to soften it. 6) And the icing sugar, boiling water, orange oil and food coloring and beat until the icing is smooth and a consistent bright yellow color. Pop the buttercream in the fridge so it doesn’t melt. 7) Remove cupcakes from oven and place on a wire rack to cool. 8) When the cupcakes are cool, use a spoon to cover them with the yellow buttercream. Don’t worry if you’re messy-it only makes them look yummier! 9) Pop them into bright colored cupcake cases and add two or three chocolate mini eggs to the top and you’re done!